We take immense pride in serving our delicious quality branded products, ice cream, lollies and refreshing cold drinks. During the week we travel to our favourite locations as well as attending a large proportion of the surrounding South West area including Somerset, Gloucestershire, and Wiltshire. With our many years of experience in the ice cream business we have become expert to providing a professional and reliable service at events of all shapes and sizes. These include: festivals, shows, company events, village fetes, charity events, college open days, school open days, weddings, parties, football tournaments, fetes and fun days. 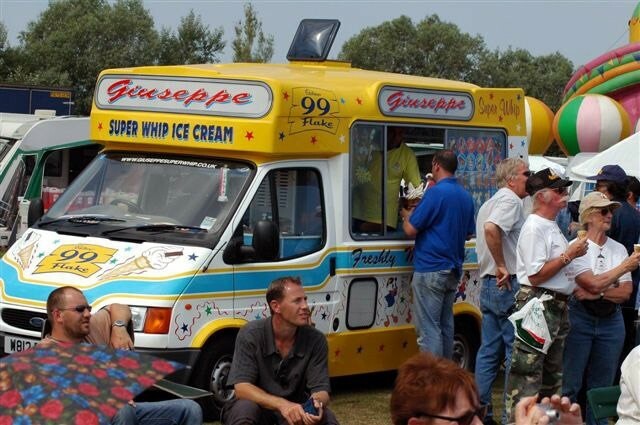 Ice cream vans over generations have charmed there way in to modern British Life. They are a favourite pastime with their distant sound of approaching chimes and with its promise of a famous Mr Whippy or an ice cold lolly! So please do get in touch with us if you have an event where you’d like to surprise your guests, summer or winter we ready to give your guests one of our mouth watering treats!